“In ten years we will still have this same character that we have now. The character of the city with balance, with balance of nature, of leisure, of good quality of economy, and good accessibility from abroad." Located right in the heart of Europe, Warsaw is poised to compete with the continent’s best cities for investment. Business friendly, with over 5 million square metres of office space, the Polish capital has established itself as an attractive hub in which to invest and live. In recent years the city’s real estate has been transformed from once grey blocks to a skyline full of skyscrapers. Echo investment, a Polish property developer, sees Warsaw as a modern city in the making. Now they are transforming an old Brewery into a trendy downtown district, a project that includes both offices and residences. More than 750,000 square meters of office space are currently being built. Half of this is inside skyscrapers. Despite a much lower number of large leases, 2016 was a solid year for Warsaw’s leasing market. Slovak developer HB Reavis chose the moto ‘the sky is the limit’ when they began building the Varso Tower. Due to be completed in 2020, at 310 meters the skycraper will be the tallest building in the EU. The Polish capital’s rise has not gone unnoticed by leading global brands. 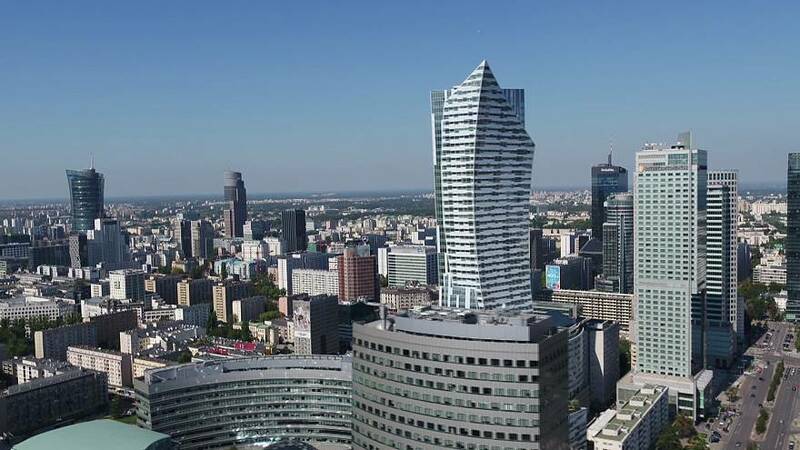 Canadian real estate firm Colliers International, active in Warsaw since 1997, believes the city has become more attractive for both existing firms and newcomers. Having such a large amount of office space in the city is always good news for the job market. But placing the right talent with the right companies is crucial if investment projects are to gain more traction. Poland’s job market remains active. In September this year the jobless rate stood at just 2.3% according to Warsaw’s Statistical Office. The international recruitment firm Michael Page set up shop in Warsaw in 2005. Its focus is on the banking and financial service sector, IT, as well as Sales and Marketing. It interviews about 18,000 candidates per year. Attractive to foreign investors, JPMorgan Chase, America’s biggest investment bank, will open new offices in the city and has announced plans to hire 3000 people. But the Polish capital is not resting on its laurels. The city’s town hall is actively working to attract big business. Warsaw’s Deputy Mayor Michał Olszewski is responsible for developing such initiatives. Now estimated to be the sixth safest city in Europe, he insists it is Warsaw’s dynamic character and rapid transformation which is luring companies from abroad. “It is mostly because of the quality of living and the very good relation between the cost and affordability of the services,” Olszewski says.